This station was once the meeting point of several railroads coming from Anatolia. After the Marmaray Project – a new commuter rail mass-transit system in that tunnels under the Bosphorus strait and lines the Sea of Marmara, initiated in 2005 – it was understood that Haydarpasa main railroad station would lose its importance as a central train station. The Marmaray Project doesn’t include Haydarpasa. The Turkish government prepared some transformation plans for Haydarpasa and its surrounding area, but did not consult the general public. The transformation project was initially designed to make Haydarpasa a World Trade Center – the Manhattan of Istanbul, marked by very tall buildings. The Urban Planners Chambers, NGOs, journalists, and experts criticized this plan when they learned about it. They claimed that it did not serve the public good, and would ruin Istanbul’s silhouette. The project was subsequently cancelled by Conservation Board of Cultural and Natural Assets. After the cancellation, the government developed a new transformation plan. It was Haydarpasa Venice Project. Urban Planners Chambers also criticized this plan because, though the buildings would be shorter, the project footprint would be much larger. The Chair of Architects Chambers criticizing plans for Haydarpasa. This video is in Turkish. Now a third project idea has been confirmed for Haydarpasa: Haydarpasa Port. This project includes religious features, tourism, guest accommodations and a cruise port. In order to implement this project, intercity trips (in January of 2013) and local trains (on June 19th of 2013) from Haydarpasa Gare were stopped. A group called Haydarpasa Solidarity gathers every Sunday in front of the building pictured above, on the stairs, to protest this Haydarpasa Port project. We have been struggling to preserve Haydarpasa as a station open to the public since 2008. Along with Seda and Mete Kiyan we have been instrumental in succefully nominating Haydarpasa to be incorporated on to the 2012-13 World Monuments Funds list ( http://www.wmf.org). Such a vital transporation site,can be renovated and at the same time remain a railway station. There are many examples of this such as London’s St Pancras station. We are an artists’ collective and organising a show in Vienna later this year to bring international attention to the plight of Haydarpasa and all the pulbic spaces in danger in that great city which is Istanbul and elsewhere in the world. Saving One’s Heritage Is A Global Struggle. The first recorded settlers in what is now called the city of Buffalo, NY were Cornelius Winney and “Black Joe” Hodges. These two gentleman constructed a log cabin trading post on Buffalo Creek. They did business with the local Iroquois people (Seneca Nation) that continued to control this area of North America. It was kept unsettled by both Europeans from Canada or Americans coming from the brand new United States of America by the British who continued to dominate locally from their base at Fort Niagara on the Niagara River where it meets Lake Ontario. The British did not leave the Niagara Frontier until the Jay Treaty was signed in 1796. The means our “civilized” history is little more than 224 years old. Our oldest local buildings, which are few and far between, generally don’t reach beyond the late 1840s – 160 years or so. Our oldest structure is the 188 year old Erie Canal. Who would think that with this community’s short history, people who try to protect our heritage would be called obstructionists by those who find history to be worthless and in need of replacement. At the same time, would you believe that in a 3,000 year old city like Istanbul, formerly Constantinople, formerly Byzantium, Turkey people would be having the same debate over saving a piece of its history. In this case, the building is not 1000, 2000 or 3000 years old. It is only slightly more than 100 years old. 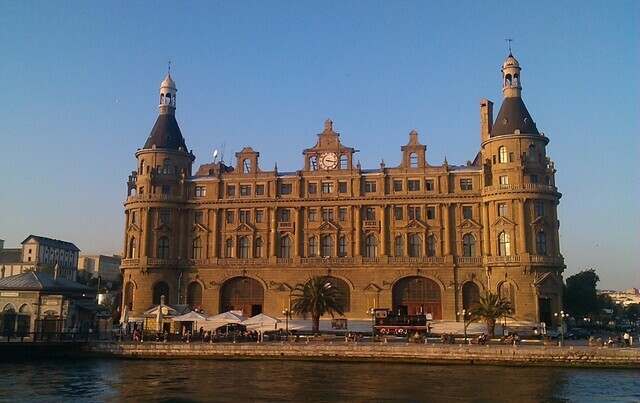 There it is – The Haydarpasa Train Station on the eastern shore of the Bosphorus. This was the terminal for the famed Istanbul-Bagdhad Railway and former Crimean War hospital where Florence Nightingale did her work. The building is under siege by modern developers who want to keep it from the public. I suppose those of us of similar mind need to stick together. As we support remnants of our heritage remember others are trying to save theirs. I would like to thank all of you for coming here to show your solidarity for Haydarpasa. Today is the first anniversary of the demonstrations of the Haydarpasa Solidarity Platform. Members have been demanding a transparent decision making process for Haydarpasa’s future twice a week since a year. Haydarpasa is a part of the European cultural and industrial heritage and needs to be protected. There is a clear democratic deficit in the decision-making processes for the future of the station and its hinterland amounting to 1 million square meters. Haydarpasa is at risk of being made idle and turned into a commercial hotel or a shopping centre. Unfortunately, Haydarpasa is not the only heritage at risk in Istanbul. Several projects are being introduced without proper civil consultation. Most of them are linked to either creating huge economic benefits at the expense of cultural and historical heritage, or building new giant landscapes. If we do not act today, tomorrow will be too late. Marmaray project and the route chosen for it bring changes to the functionality of Haydarpasa station. The traditional heavy traffic that brings passengers by suburban trains to ships at Haydarpasa to cross to the other side of the city will significantly decrease once the underwater tunnel connection is established. 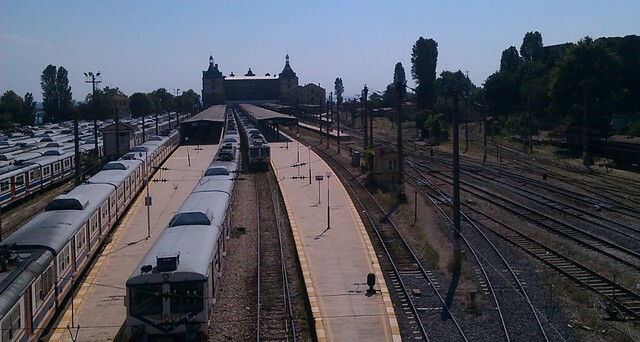 However, there are ways to keep Haydarpasa operating for other suburban traffic as well as intercity trains. Any decrease in the utilization of the Haydarpasa premises can only open new possibilities for additional public cultural functions. We, the solidarity movement for Haydarpasa, demand that any decision related to modification of its function needs to be taken following extensive consultations within democratic mechanisms. • the citizens are always granted unrestricted free access to Haydarpasa building and its premises. This story begins nine years ago in Cuernavaca, Mexico. In August 2002, bulldozers tore into the remains of the Casino de la Seva, annihilating a site made famous by the opening scene of Under the Volcano, Malcolm Lowry’s great novel about lost love and redemption. Covering the event for the Mexican daily Excelsior, I watched as security men and their dogs held back protestors and earth-moving machinery proceeded with the destruction of the historical structure, pulverising the Mexican murals inside. Today, the gambling club’s lush gardens are paved over, and the ornate salon replaced with a Costco mega-store, an American discount supermarket chain. It was then, inspired by the local activists, that I became a volunteer heritage preservationist. Now, let’s change place and time to Istanbul in 2010. That summer, I spent several weeks documenting the life of a train station on the Asian side of the Bosphoros called Haydarpaşa. Built by German engineers, the neo-Gothic structure was a gift from the last Kaiser to the last Ottoman Sultan. On sweltering days, I spent many hours at the “Gar Bistro” in the station’s arrival hall, talking to locals over delicious cold platters. I was told of rumours that the station might be closed down and converted into a luxury hotel as the government privatised the Turkish railways. That autumn, fate dealt its hand: an “accidental” fire swept through the upper floors, damaging the roof and the administrative offices. The damage was extensive and repair work now, while undway, is slow. Ironically the calamity raised worldwide attention to the station’s plight. This October, Haydarpaşa’s future may yet take another turn, as the World Monuments Fund (WMF) announces its 2012 watch-list of endangered historical sites. Since 1996, the New York based NGO has published its bi-annual World Monuments Watch to spotlight one hundred cultural heritage sites across the world threatened by neglect, commercial development, natural disasters, or war; the listing aims to foster community support and attract technical and financial assistance for their preservation. Sites of all types and periods, from the ancient to the contemporary, from archaeological excavations to architectural jems, even landscapes and cityscapes. All have made the list. International and local preservation groups and local authorities nominate the sites, while an independent panel of experts makes the ultimate selection. Last November, the Istanbul-based architects Mete and Seda Kiyan and I submitted a nomination for the Haydarpaşa railway station; there’s a good chance it will make it onto the WMF’s list this autumn. In Vienna, three buildings have had the ambiguous honour of making it onto the WMF’s list of outstanding, yet endangered, heritage sites: the Franciscan Church on Franziskanerplatz in the 1st District, the Belvedere palace in the 3rd, and the Wiener Werkbundsiedlung in the 13th District, a landmark of modernist architecture. It is difficult to assess the impact of the WMF’s listing on the protracted political process of heritage preservation. However, the City of Vienna seems to have responded to the WMF’s calls for action. The Franciscan Church and the Belvedere have been gleamingly restored since their inclusion in the first watch-list in 1996. However, the Werkbundsiedlung provides the most striking example of what an international heritage listing can do. It was added to the 2010 Watch in October 2009, after years of party political disputes had done nothing to stop moisture seeping into the porous 1930s brickwork. Promptly in the summer following the listing, the City of Vienna announced the funding of restoration work; on 18 Aug. of this year, the work began. The Werkbundsiedlung, or “Workers’ Association Settlement”, is a unique ensemble of model houses designed by 32 architects of the Viennese modernist movement such as Adolf Loos, Josef Hoffman, and Clemens Holzmeister. Between 1930 and 1932, under the leadership of Josef Frank, they developed 33 different housing types, providing comfortable and functional living quarters in a highly limited and affordable space. Frank set the buildings, grouped according to type, into an urban master plan spanning a triangular plot between Veitingergasse, Jagdschloßgasse, and Woinovichgasse. Today, 48 of the 70 apartment buildings are still owned by the City of Vienna, and rented out as public housing at a low rate. As such, the City and its public housing branch – Wiener Wohnen – are paying for the restoration, which is scheduled to end in 2016 and will run up a cost of €10 million. Michael Ludwig, the City’s councillor for the construction of public housing, told the press agency OTS that the large sum was due to the huge variety of design between the houses, with door hinges and window frames that have to be individually re-created by hand. Despite this state-of-the-art restoration, however, the original purpose of providing affordable public housing will be maintained, and all the existing rental contracts continued. Like credit rating agencies, international heritage organisations such as the WMF are in the business of imagination: Their recognition bestows value to public property. Therefore, their verdict may prevent, or accelerate, its privatisation and re-development. While many of the residents of the Werkbundsiedlung were unaware of their surroundings’ significance, the recent attention by the WMF and city planners must leave them in little doubt. The railway staff at Haydarpaşa, meanwhile, are hoping for a similar boost which might preserve the station’s public purpose and keep the property sharks at bay.